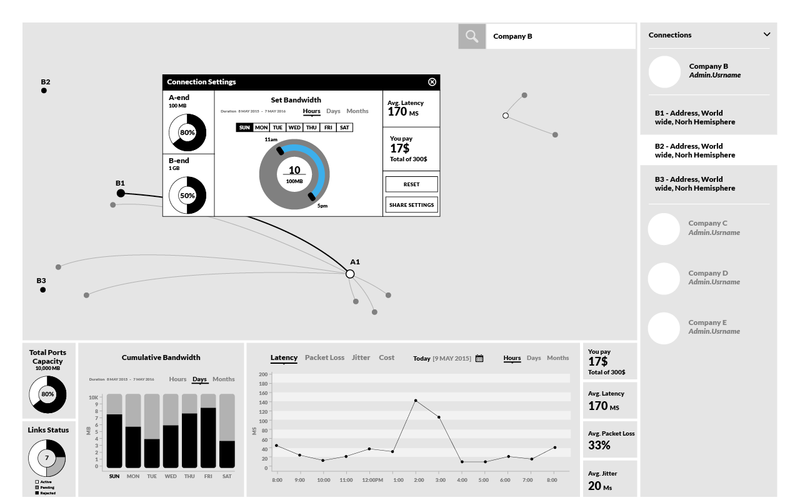 Console introduces the new concept of Interconnection 2.0… a fully-automated enterprise software and interconnection platform that enables companies to bypass the public Internet and directly connect business networks to each other with a click of a button. With over 170 Console nodes (points of presence) across the globe, the Console platform provides enterprises with secure, simple and direct access to a global ecosystem of cloud infrastructure providers, SaaS providers and partners, including Amazon, Microsoft, Google, LinkedIn, Box, Zendesk and many others. I started as the only designer when we were only 5 people in the entire technology group. During the first year I've head-hunted and recruited three of the best designers in Brisbane to join me on this incredible ride. We all wear multiple hats, from strategy and ideation, pixel perfect UI, animated prototypes and presentation demos to user interviewing and testing. "The enterprise world is increasingly moving in a cloud-first direction. On its own, this trend is absolutely a positive step forward. But, the fact that it’s happening over a public, un secure, unreliable Internet should concern everyone. Leaving business-critical traffic and apps vulnerable to potential attacks is a risk that today’s enterprises should not and cannot take. With direct connections, they don’t have to. 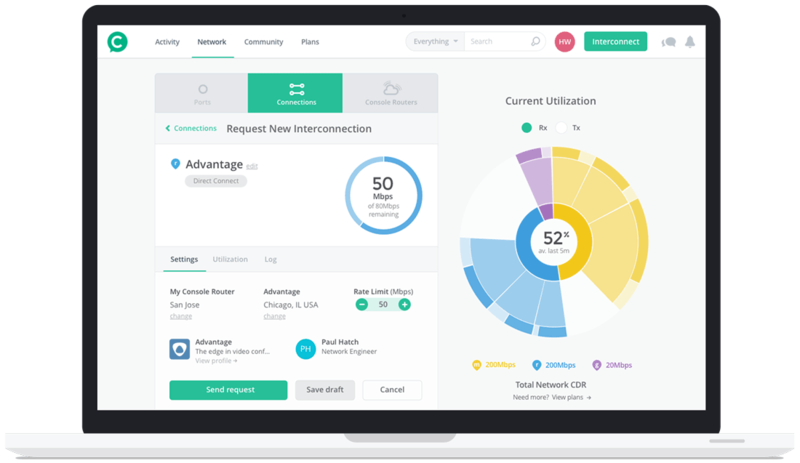 Console provides enterprises and SaaS providers around the world with easy-to-implement, cost-efficient direct connections" [Kevin Baker, Product Manager]. Before deciding what exactly it is we should design for a new project, it's crucial for the efficiency of the development process to confirm three interrelated aspects - business goals, user needs and technological capabilities. Designing a feature that doesn't validate all three conditions, will either interfere with the revenue model, sit to dry in the backlog or simply never get used. However, in the early stages of any radical-innovation, requirements are vague, technology is theoretical or experimental, and users are only in potential. The first step was to define the problem in hand. It was observed that more and more businesses realise the advantage and benefits of direct interconnection. Nevertheless, only very few companies were actually doing it. Why? After interviewing stakeholders, existing customers and interconnection experts I learnt that direct interconnection is considered so complex that enterprise IT and system admins often refer to it as ‘black magic’, done only by those few top network engineers. Our first mission, therefore, was to break down this notion to all the complexities within the existing process of interconnection, so we can simplify it, by design, for the enterprise user. 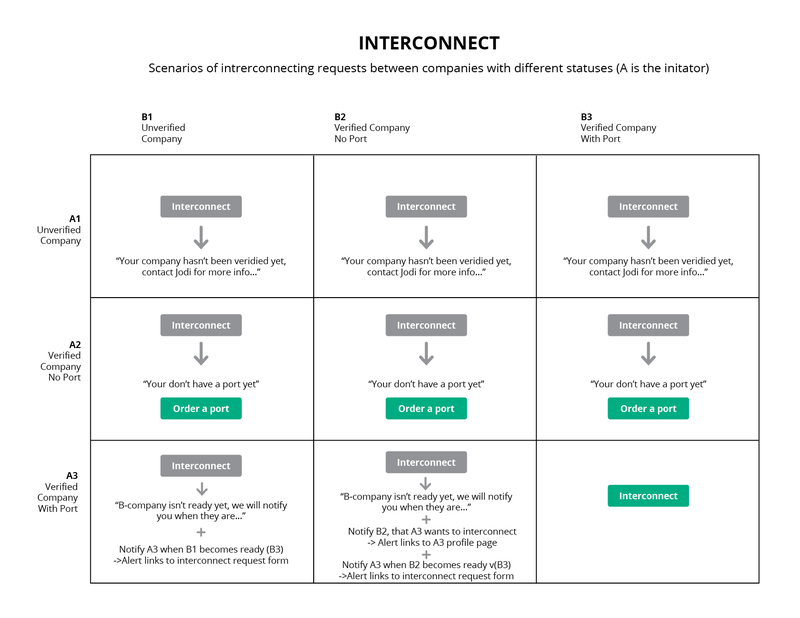 Traditionally, interconnection is a long, manual and physical process. But even if we'd simplify the entire technical part, which is the main complexity, there is still a human aspect to the process that cannot be automated. Imagine Bill, an IT professional in a medium sized enterprise who wants to interconnect with a SaaS company that provides his business with financial tools, on which his business critically relies on. Before router configurations and BGP sessions, the first thing Bill has to know is who to contact in that SaaS organisation. Then, he'd have to convey a good business case for them to agree to the interconnection. If successful, he'd have to maintain a personal relationship in order to keep their networks connected. After listening to many interconnection stories, we've realised that beyond, or better put- prior to- the functional requirements, if we want to create an effective solution, it will have to include a social aspect, where people and companies are present, interacting and sharing knowledge with each other, before and after their networks get connected. One of the main tasks we have as designers is defining the scope of a feature in terms of contextual use case. Illustrating the conditions and settings in which each use case takes place is essential for the planning phase. By creating these documents we communicate the scope back to managers and developers so everyone is aware, and can prepare if applicable, while we are working on the UI design itself. When designing rich, technical and complex functionality such as network operations, wireframes are crucial to the ideation process. By sketching ideas and presenting them early to stakeholders, managers and customers, we were able to better define the depth and breadth of our current product's requirements, as well as imagine future development and innovation. During the development process we struggled to communicate the detailed interactions, transitions and nuanced reactions in the UI to the developers. Sketch, Principle and InVision, along with improved collaboration between design, engineering and marketing teams, helped us create elegant UI screens, define and demonstrate all the relevant interactions and share it with the rest of the team, for feedback and discussion. Sometimes we re-used these UI animations to create demo videos and presentations for potential customers and investors.